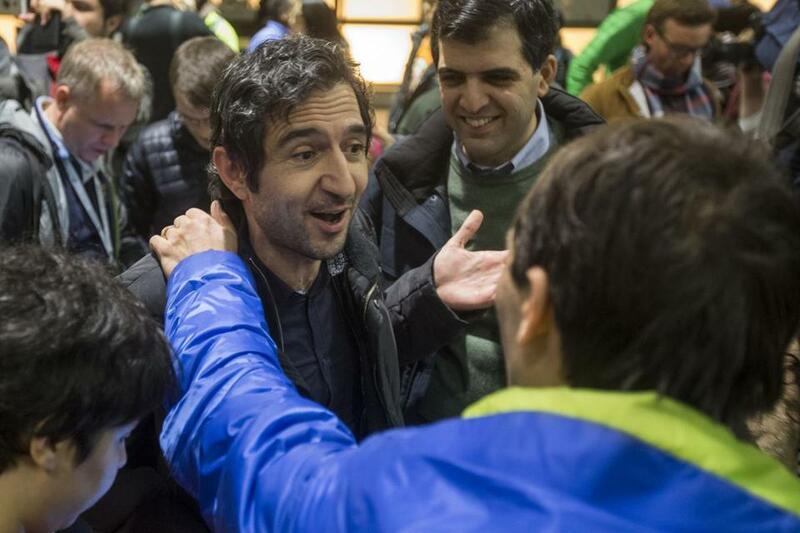 Mazdak Tootkaboni was welcomed after being detained at Boston’s Logan airport. He and his wife, Arghavan Louhghalam, are professors at UMass Dartmouth and are green card holders. 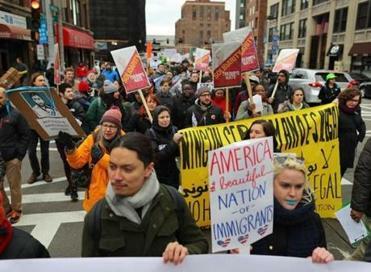 Confined to a holding room at Logan International Airport Saturday afternoon, two UMass Dartmouth professors had no idea that their detention had become the basis for a legal challenge to key portions of President Trump’s immigration order. Mazdak Pourabdollah Tootkaboni and Arghavan Louhghalam, a married couple, had been on their way back from a weeklong sustainable engineering conference in Marseille, France, Tootkaboni said in an interview Sunday morning. The first inkling that something had changed came when an official at Charles De Gaulle Airport in Paris cautioned them that new rules, enacted in the past 24 hours, could cause the couple some problems on their journey home. “He checked a few things and said, ‘because you gave green cards you should be OK,’ ” said Tootkaboni. So the couple, Iranian immigrants who have lived in the United States as permanent residents for more than a decade, boarded the flight home at about 4 p.m. Paris time. The trip was routine. The couple watched movies, and the flight landed early. An Iranian scientist headed to Harvard Medical School was among those affected by President Trump’s order. Only after they’d gone through the standard process for re-entry did things change. The couple and about a dozen others were pulled aside and informed that they were now subject to a “secondary process,” said Tootkaboni, 40. And so they waited. There were occasional routine questions, he said, about the trip and their jobs (both are engineering professors with doctoral degrees from Johns Hopkins University). The officials who questioned them were pleasant, Tootkaboni said, and checked in every half-hour or so to see if they needed water or a trip to the restroom. “They were very, very professional and unexpectedly kind and nice,” Tootkaboni said. Unbeknownst to the people waiting, who Tootkaboni said were barred from using cell phones, the scene in the airport outside was growing chaotic. Lawyers for the American Civil Liberties Union Massachusetts found Louhghalam’s sister, Tootkaboni said, and got their names. Their detention, which lasted about four hours, became the basis for a judge’s overnight ruling that prohibits people lawfully entitled to enter the country from being detained or removed. When Tootkaboni and Louhghalam finally emerged — they were nearly the last to be cleared — they walked into a roiling protest. Tootkaboni said he wasn’t sure what would happen next — whether they would continue to be involved beyond the seven-day temporary restraining order that was issued overnight, and in what capacity.